“The Akai S6000 Sampler V2 with TR-808, XLEAD, D-50 Samples Loaded. Plus Manual and Keyboard. The Sampler was made at arguably the height of hardware samplers production (when they were used in pop records). Everything about this unit is professional. Check out the picture with the connections on the back of the unit. Proteus XLEAD Arpeggios (A number of single samples). Roland D-50 (A number of Multi-samples). Korg M1 (A Strings sample). This model has the following spec. – The plastic locking tabs which hold the bottom of the screen to the sampler have snapped off. It still connects to the sampler and holds it in place with the two locking nuts at the top. In use you’ll probably unscrew these and have the handy screen interface unit on your lap or on the desk anyway. “Up for sale is my S6000. It is maxed out with options including ADAT interface, USB and a 300Gb drive, FX and max polyphony. It works perfectly and sounds great but I have recently upgraded my main computer after resisting for a long time, so it is no longer needed. This works with ak.sys, which can still be found in the legacy section of Akai’s website. AKAI S6000 Sampler ohne OVP !!! Artikel ist nur mit Netzgerät so wie in original Fotos geprüft ( alle Tasten gehen ) da es schon abgebaut war können wir nichts weiter sagen , Bedienteil läst sich nicht mehr rasten da Muttern fehlen ,Optisch hat es Lagerspuren ( original Folie ist noch Beklebt ) ohne OVP für Profis zum Versteigern ! Der angegebene Preis ist differenzbesteuert gemäß §25a Umsatzsteuergesetz. In der von uns erstellten Rechnung können wir die MWST aus diesem Grunde nicht ausweisen. Bitte betrachten Sie die Bilder (sind Bestandteil der Verkauf ) , um sich selber einen Eindruck zu verschaffen. Bei etwaigen Fragen oder weiteren Detailfotos bitte mailen. Schauen Sie doch auch in unsere weiteren Angebote. Vielleicht können Sie ja ein Schnäppchen machen und Versandkosten sparen! Beim Erwerb mehrerer Artikel werden nur 1x Versandkosten berechnet. 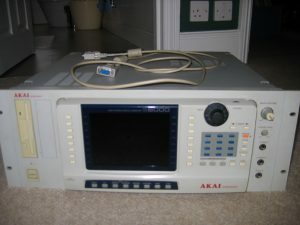 Here for sale is the top of the range Akai Sampler. It is in Excellent Condition and Works Perfectly. It is very clean with hardly a mark on it. (One of the little pieces of plastic on the sampler is loose but the screen still holds in place fine with the other one and the screw luggs). It comes with the Short Screen Lead. “This Akai pro S6000 comes in good working order. The sampler comes loaded with 36GB Internal hard drive, 256MB of sampling RAM, 128 polyphony, 32 MIDI channels and 16 outputs. The samplers software version is 2.14. ” I’ve decided to downsize and sell off some of my studio gear and this hasn’t been used in along time. This has been in storage for the past 3 years and when it was in my studio it had very light use. Included in the sale is 181Gb external hard drive, which comes with a 13Gb sample, loop and beats library( 168Gb free space). This sampler has the full 256 meg of ram fitted and also has the optional usb card fitted too. This machine is in very good condition and shows no signs of wear on any knobs, buttons or sockets. 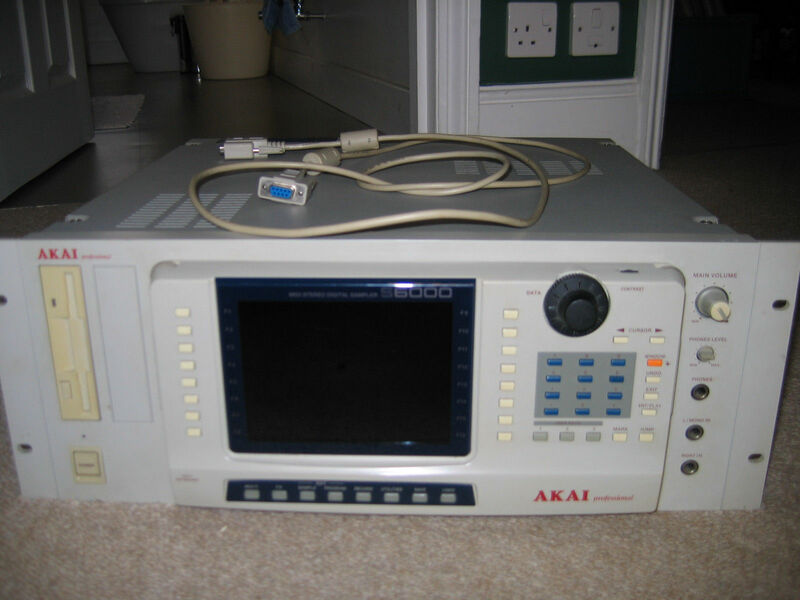 There aren’t that many Akai S6000’s that come up for auction on ebay in this good condition and with this high spec, so if you are looking for one of these samplers this is a near pristine machine. C/W: 13 AMP MAINS CABLE, 4 METRE SERIAL CABLE, MANUALS, AKAI SYS SOFTWARE & ALL FIRMWARE & PDF FILES ON CD. IDE-SCSI Bridge released for the Akai S5000 and S6000 Series Samplers. May work in other Akai units. “Boxed Akai S6000 with USB card, Effects Card and 64MB RAM. “1999 Akai sampler. Screen no longer comes alive on power up – it might be just a faulty screen cable. THIS AKAI S6000 SAMPLER IS IN VERY GOOD CONDITION WITH VERY MINOR SCRATCHES ON THE TOP CASING. MANUAL INCLUDED. – ADAT card fitted giving 16 ins / outs. – USB Card fitted – control it from your PC/Mac. – 9 Gb Internal hard disk. – SampleVerbII (EB20) 20-bit 4-Channel Multi-effects Processor. – Extension lead between the detachable panel and the unit. ” Up for auction is my akai s6000. In perfect working order. Only thing wrong is word clock port is bent some. It was like that when i bought it. Otherwise great condition.